The plastic clips are made from a high quality acrylic material. We make 12 colors available for your fashion requirements. 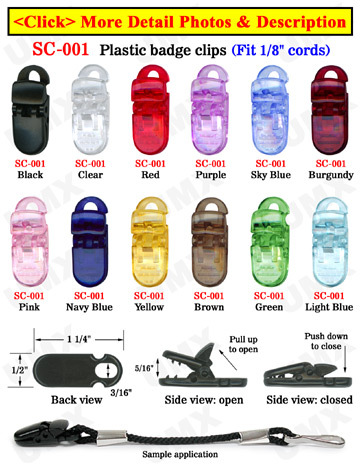 These plastic clips are commonly used as name badge clips, nametag clips, baby pacifier clips, and in conjunction with x-ray scan-free devices. 1) Question: Can I combine several colors to make-up 100 pieces to purchase by the bag to get the total price break?